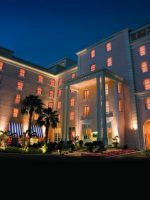 Listed on the National Register of Historic Places, the Breakers Palm Beach is Florida’s most celebrated historic hotel. 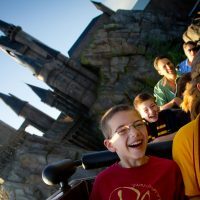 It could also be lauded as the most family-friendly and strikingly beautiful (and in a state full of resorts that work hard to cater to families, that’s saying a lot). Located on 140 acres and fronting a spectacular oceanfront stretch in Palm Beach, one of the nation’s wealthiest zipcodes, the family-owned resort has been devoted to celebrating the good life since storied Sunshine State developer, Henry Morrison Flagler, built the original property here (then known as the Palm Beach Inn) in 1896. That building burned down, as did the one that replaced it, and the beautiful 540-room Italian Renaissance-style structure that exists today was constructed in 1926, with 73 artisans brought in from Italy to hand-paint the magnificent artworks decorating the hotel’s lobby ceiling and other public spaces. This is a formal hotel, to be sure, with elaborate floral arrangements everywhere, expensive boutiques, swanky restaurants and perfectly manicured gardens and golf courses. But the oceanfront pools (of which there are four), top-notch family entertainment area, wide range of restaurants and beautiful sweep of beach that fronts a terrific coral reef for snorkeling, promise the best in tropical luxury vacationing for families. 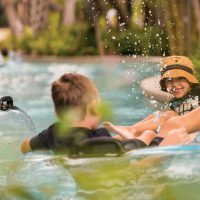 The Breakers is the kind of resort that makes it easy to stay put, with things like golf, tennis, basketball, scuba diving lessons and snorkel, kayak and paddleboard rentals all offered onsite. 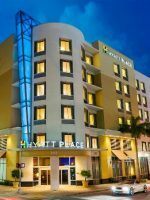 Plus, the world-class shopping and dining of Worth Avenue is just a short bike ride or drive from the hotel, as well as the more varied options that await visitors just across the bridge in West Palm Beach. For old world Florida glamour in a setting that rolls out every modern comfort, there’s just no beating the Breakers Palm Beach. 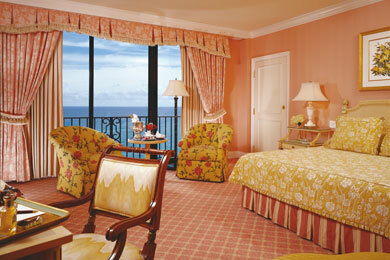 All of the Breakers' 540 rooms underwent a redesign in 2011 during a full resort, $80-million overhaul. The result is modern accommodations with a soothing color scheme (mainly taupes and sea grass greens), dark wood furniture, marble bathrooms and the option of a king bed or two double beds and ocean or resort views in all available suite and room options. Complimentary rollaway beds, cribs and connecting rooms are available upon request. Kids ages 16 and under always stay free in the same room as their parents. If you're traveling with infants or kids ages 3 and under, you can request that your room be childproofed before your arrival with things like furniture corner guards, outlet socket covers and infant baths and spout covers for the bathtub. The Breakers can also provide bed rails, diaper changing tables, bottle warmers and even nursing equipment, all of which can be requested when you reserve your room. Strollers are available for a nominal fee in case you don't want to travel with yours, and mini-fridges can be reserved in advance and delivered to your room, too, even stocked with juice boxes and the like at your request. Premium Resort View and Premium Partial Ocean View rooms are oversized versions of the standard guest room with 400 square feet of space to stretch out in and a couch. There's room for a rollaway bed in this room, so you can accommodate up to five people with two double beds. At the top of the room heap are the oceanfront rooms, with unimpeded views of the deep blue Atlantic, 460-square feet of space, marble bathrooms with a separate shower and bathtub and a narrow step-out balcony. Here, too, you can request two double beds or one king bed and there's room for a rollaway bed, allowing up to five. The hotel has 68 suites, the smallest of which is the Classic Suite Resort View, at 500 square feet, with one kid bed and one sofa bed. The Junior Suite Resort View has 525 square feet with one king or two double beds and a sofa bed in the living area. The Oceanfront Junior Suite (600 square feet) offers one king bed, one queen sofa bed, a step-out balcony and separate shower and bathtub. The Deluxe Suite Resort View (600 square feet) category lacks the ocean views, but has a living room with a queen sofa bed separated from the king-bed master bedroom. Executive Suites are similar, with a separate living room and sofa bed, but much larger at 1,100 square feet. Premium Suite Resort View rooms have a private living room and master bedroom in 800 square feet of space, and are close to the pools. Oceanfront Suites come in at 750 square feet and have beautiful views and a separate living room and sleeping space. And Premium Oceanfront Suites (900 square feet) also have a separate a living room and sleeping room and the addition of two step-out balconies to take in the ocean views (instead of just one). The Grand Suite Restricted View suites have 950 square feet with one king bed and one sofa bed. 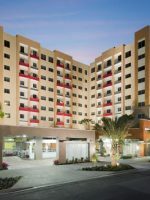 The second largest suite is the Royal Poinciana Suite - it has 1,250 square feet with one king bed and a sofa bed, as well as a step-out balcony and six-seat dining area. The largest suite is the Imperial Suite with 1,700 square feet of space, one king bed, a large balcony and personal concierge services. The hotel's club level, on the sixth and seventh floors, is a restricted-access area called The Flagler Club, where the rooms and suites range from 300 square feet to 550 square feet. Staying here gets you personal concierge service and enhanced amenities that include continental breakfast, afternoon tea, evening hors d'oeuvres, fresh-baked cookies for the kids and more. Additionally, the hotel offers Deluxe Resort View Rooms, with 300 square feet and space for up to two guests (rollaways are not permitted). Comfortable place and nice food. Worth a weekend. Nice adult lap pool and easy access to golf course. The only snag was a recommendation to go to a restaurant called Echo off site. It was horrible. I really do not know how hotels get in the habit of recommending horrible restaurants. A day spent under the rustling palms at one of the Breakers' four exquisite oceanfront pools, with salty breezes on the area, is as relaxing as a Florida vacation gets. The property's Beach Club is a sprawling verdant expanse staggered with four pools and five whirlpool spas, among them a 25-meter-long, adults-only lap pool, a main pool, the south pool surrounded by bungalows and a dedicated family pool called the Active Pool, which has zero-depth entry and is where you'll find most families hanging out. Poolside fun includes glitter tattoos and games. Swimming lessons can be arranged, too. There are plenty of comfortable lounge chairs to go around (the moment you arrive, someone is there to set you up with fresh towels and cushions), and luxury poolside bungalows are also available for daily rental near the Active Pool. These open-air structures are outfitted with a mini-fridge, couch, TV, Playstation III Games and a full bathroom. There's also a concierge on hand to cater to your every whim. The only pool that is not open to kids is the lap pool, and it's a very pleasant place to get some quiet exercise if you can slip away for a little while. All pools are open from sunrise to sunset and are staffed by lifeguards. The beach right in front of the Breakers, accessed via a wooden staircase, is a relatively small stretch of sand equipped with lounge chairs and umbrellas available at no extra charge. The water can often be rough here, and there's a lifeguard on duty during main beach hours to keep an eye on changing conditions. You can go for long walks on the stretch of public beach that stretches north of the Breakers. On days with calm seas, it's well worth renting a snorkel, mask and fins to go underwater sightseeing around the reef just in front of the Breakers, where you'll spot tropical fish and, if you're lucky, see a sea turtle or sting ray, too (guided snorkeling trips are often offered). 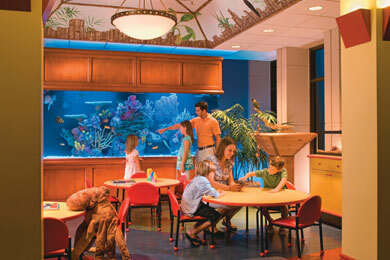 The resort also offers Kids' Intro to Scuba classes, held in the pool rather than the ocean, several times a week. Kids ages 10 and older can also get their PADI scuba certification here. Kayaks and paddleboards are available to rent from the Beach Club. Consider registering your kids in the property's terrific Camp Breakers, with a range of land-based and water activities designed for kids ages 3 to 5 or 6 to 12. Morning sessions are available from 9 a.m. to 1 p.m., and evening sessions are from 5:30 to 9:30 p.m. Full-day sessions are from 9 a.m. to 3 p.m. Camp staff are fully trained in CPR, AED and first-aid. Land-based activities have a one-to-six counselor-to-child ratio and water activities have a ratio of one-to-four. Snacks and drinks are included in the fees. Located near the Italian Restaurant on the property, the 6,100-square-foot Family Entertainment Center is another spot likely to attract the younger members in your entourage. In the outside area, there's a basketball and dodgeball court, two pet tortoises to visit (with scheduled daily feedings) and a playground built in 2015. The play area is illuminated at night and features tunnels, swings, slides and interactive sensory games that light up and make noise. The indoor component to the facility connects directly to the Italian Restaurant and has an arcade room with 20 games, a video game lounge with Xbox One and Playstation IV, a Camp Room for crafts activities and a 1,000-gallon saltwater aquarium. There is also a toddler and children's play room stocked with toys and surrounded with glass windows to let parents keep an eye on their kids while they're dining at the Italian Restaurant. The Breakers is a great place to get your kids into golf, with Family Fun Golf offered daily after 3 p.m. at the Ocean Golf Course. Children ages 5 to 16 play for free and also get free club rentals when accompanied by a paying adult. Kids can take lessons on everything from swinging, chipping and putting to on-course play at the property's Junior Golf Academy, which holds summer camps and holiday and spring break clinics. Beach cruisers are available for rent and come with mandatory helmets for guests ages 16 and under. The resort has 10 Har-Tru tennis courts that are lit at night, and clinics and private lessons are offered. The Breakers' 20,000-square-foot spa has 17 treatment rooms and offers the usual ranges of massages, facials and wraps. It also features a Spa Petite menu designed to pamper kids ages 6 to 12 with things like ice cream treatments and Mommy and Me treatments. 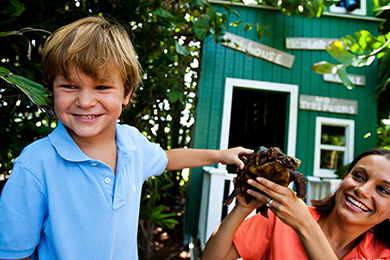 Check the Breakers' daily activity schedule for a roster of planned family outings that might include guided historical beach tours around Palm Beach, catamaran cruises, beach bonfires, tennis round-robins or eco tours. Despite the obvious formality of some of the hotel's restaurants, families are warmly welcomed in all of the property's dining establishments. And better still, kids ages 2 and under eat free when ordering from the childrens' menu (HMF is the only restaurant that doesn't offer a children's menu). Kids' orders are also always placed immediately so they are served as soon as possible. Start your day with breakfast at the Beach Club, served from 8 to 11 a.m. daily with your choice of an excellent buffet ($35 per adult and $14 per child) with made-to-order omelets and waffles, pastries, bacon, sausage, fresh juices, yogurts and much more. An a la carte menu is also available. There are tables outside with umbrellas, plus pool and ocean views, or you can sit in the breezy interior dining room. The Beach Club also serves lunch from 11:45 a.m. to 3 p.m., with sandwiches, salads, lobster rolls, kosher hotdogs and the like, plus kid's menu favorites (priced from $9.50 to $11.50), such as organic PB&J, penne pasta, burgers, grilled cheese, chicken tenders and mozzarella strips. All kids' meals are served with a beverage and ice cream sandwich or fruit cup for dessert. Highchairs are available. The other breakfast option at the Breakers is the Circle, a formal dining room with hand-painted ceilings and ocean views. It hosts one of Palm Beach's best breakfasts (Monday through Saturday from 7 to 11 a.m. and Sunday from 7 to 10 a.m.) and brunches (Sunday from 11 a.m. to 2:30 p.m.). Despite the formal ambiance, families abound and you'll see plenty of guests dining in their workout wear. The buffet is a lavish spread of meats, cheeses, hot food stations, sushi and much more ($14 for children). And there's also an a la carte menu with kids' favorites, such as cold cereals, omelets, chocolate chip pancakes, French toast and more, priced between $3.50 and $9. For a casual lunch by the pools, head to the Ocean Grill, which features indoor and outdoor seating on a covered porch. It's open from 11 a.m. to 6 p.m. and serves things like wings, Asian lettuce wraps, fish tacos, burgers, chopped salads, tuna sandwiches and mahi mahi sticks, plus grilled cheese, chicken tenders, burgers and more for the kids. The Surf Break, by the south pool, offers light bites such as fish dip, quesadillas and fish tacos in an open-air bar setting. Hours are 11 a.m. to 6 p.m. The Seafood Bar, specializing in sushi rolls, sashimi and grilled seafood and great ocean views, is open for lunch, dinner and cocktails from 11 a.m. to midnight. Be sure to show your kids the glass-top bar, which is actually an aquarium complete with fish that flit about under your drink. The kids' menu offers shrimp tacos, mac and cheese, chicken fingers and pasta priced from $9 to $13 and with a drink and ice cream sandwich included. 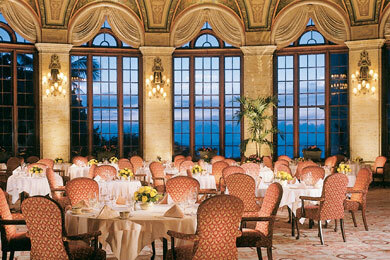 The far and away best restaurant for families at the Breakers is the Italian Restaurant. Located just back from the pools and right near the playground area, it's attached to the Family Entertainment Center, which allows parents to have a view of kids playing while they eat. Open for dinner only from 5:30 to 9 p.m., the restaurant has items like brick-oven pizzas (real crowd pleasers) and, on the kids' menu, items like organic mac and cheese, chicken tenders, ravioli, pan-seared snapper and baked chicken breasts are priced around $12 to $16. All kids' items come with a drink and dessert, such as a sundae or chocolate chip cookie. For Asian-inspired dishes, Echo and its Dragonfly Lounge serve dinner and drinks daily from 5 to 10 p.m. The dinner menu includes sushi, soup, salads, calamari, spare ribs and more. The children's menu features sesame chicken, lo mein, beef and broccoli and lemon chicken, as well as ice cream for dessert. Right across the street from the hotel but still on the property, Flagler Steakhouse is open for lunch from 11:30 a.m. to 3 p.m. and dinner from 5:30 to 9 p.m. A complimentary shuttle can bring you there if you prefer not to walk. The pricier kids' menu here includes things like petite filet mignon and broiled sole from $12 to $20, with a dessert and beverage included. This spot is perfect for a special night out. This is a swanky cocktail-lounge style restaurant just off the Circle called HMF (for Henry Morrison Flagler), where dinner and bespoke libations are served every night from 5 to 1 a.m. There's a world-class wine selection here and the menu ranges from Japanese Robata-style food with sushi and sashimi to charcuterie plates and fusion tacos and wraps inspired by the best food trucks out there. Kids are certainly welcome here, but the restaurant takes on a nightclub vibe as soon as darkness falls and you may feel a bit out of place. Room service is available 24 hours a day via a separate menu that includes burgers, sandwiches, salads, steaks and more. Wireless Internet is complimentary for guests. Childcare services are available for children under 3 years and infants and toddlers who are not potty trained. Babysitting costs $25 per hour for one child, $30 per hour for two and $35 per hour for three. You'll have to hire a second sitter if you have four or more children. Parking is valet and costs $25 per day. Same-day dry cleaning service is available. News and Gourmet is a shop on the ground floor that sells snacks, drinks, souvenirs, beach wear, sunscreen and the like. The business center offers printing, faxing and Internet services, and is open 24 hours. The indoor-outdoor fitness center, Ocean Fitness, is open 24 hours and has all top-end cardio and weight-lifting equipment and an oceanfront outdoor terrace for fitness classes. There's a free shuttle to bring guests to Flaglers Steakhouse, located right across the street from The Breakers (10-minute walk). On the kids' menu are things like petite filet mignon ($19.75), mini chicken cutlets ($14) and pizzas ($13). Palm Beach, popular with snowbirds and part-time residents, is one of the places in Florida with the most seasonal swing. January to April is peak season in Palm Beach and also when you'll find the Breakers and its restaurants and recreation areas at their busiest (and prices at a premium). May to September, which coincides with hurricane season and the hottest time of year, is the off-season. Shoulder, a particularly pleasant time to visit weather-wise, is from October to December. The hotel is often busy with weddings and corporate events that take place here year-round. 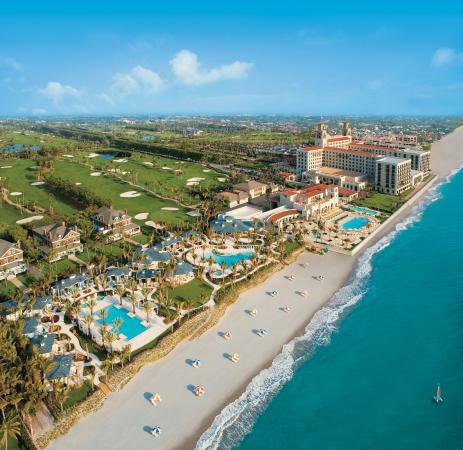 The closest airport to the Breakers is Palm Beach International Airport, about 6 miles west of the hotel. 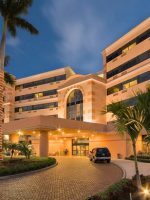 The Fort Lauderdale-Hollywood International Airport is about 53 miles south of the hotel and Miami International Airport is about 75 miles away. All three airports offer flights on major airlines and all of the international car rental companies are also onsite at all airports. With so much to do on the property, families won't need a car to enjoy the pools, the beach and the activities that the Breakers offers. 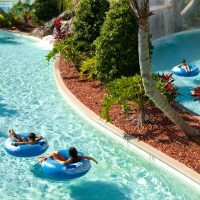 However, if interested in exploring the surrounding towns or day trips to other Florida destinations, a rental car is needed. It's worth engaging the Breakers' babysitting service for a night for the two of you to make the most of the property's special setting. Enjoy cocktails at The Seafood Bar, overlooking the crashing waves, before heading to HMF for dinner. 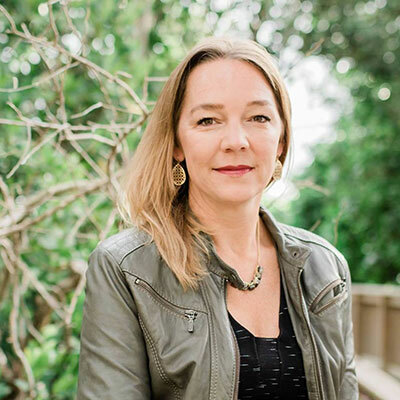 There is also always the option of a couples' massage at the onsite spa, or an afternoon exploring West Palm Beach and Clematis Street, where Rocco's Tacos always makes for a fun and happening dinner scene.